The sprawl of London covers 620 square miles…and getting around it can require time and patience. When you fear your feet may fail you, here are your best options for wending your way across London. As you plan your trip around the city, it’s advisable to study a map (like the Collins Pocket Atlas for London) that features surface streets, neighborhoods and public transport stations all in one place. If you’re a disabled traveler planning to visit London, here’s what you’ll need to know about navigating the city’s public transport. With a little preparation, you’ll gain a better sense of local’s names for neighborhoods — ideal when asking for directions — and feel more confident when faced with the choice between walking and and taking a ride. Oyster cards (also referred to as “Travelcards”) are plastic cards that can be used in place of paper tickets for the Tube, Buses, some National Rail services and the Docklands Light Railway. Worthwhile if your stay in London is a week or longer, Oyster automatically works out the cheapest fare for all your journeys. Order one online to be sent to you before you even arrive in London. Purchase locally in an Oyster Ticket Stop or at a wide variety of transport stations. Oyster card running low? Money can be added to it wherever one can be purchased. Colloquially known as the Tube, the subway won’t get you everywhere (less than 40 of the 275 Underground stations are on the southern side of the River Thames) but it can help you quickly and easily cover much of the city’s most-touristed territory. The map of the London Underground (available in a free, paper version at any station) is designed to be straightforward: its twelve route lines are color-coded, its stations are clearly named, and each station platform is labelled by direction (e.g. northbound, southbound, etc.). While you may find yourself on the wrong train from time to time, maps beside each platform and on every train should help set you back on the right path within a few stops. The Tube is open 364 days a year (closed Christmas Day), and runs from 5:30 am until midnight. Fare pricing is divided into six zones, with Zone 1 in the city center. The more zones you cross, the more you’ll pay. Credit cards and cash are accepted, and human beings are available to help with ticket purchases. Children under 5 can travel free anytime on The Tube. Construction on the Tube is ongoing, often on the weekends. Click here for up-to-date information on station closures or to sign up for advance travel news emails for your trip. Strikes are also common, so be sure to click here to see if a Tube strike has been announced. Buses run all over London and are easy to use, but congested roads mean they generally won’t be the fastest way to travel. However, the combination of travel and sightseeing make them a great means of learning the city’s layout. Use this link to plan your bus route. Not all bus services are 24-hour, but most of the main routes feature night hours. 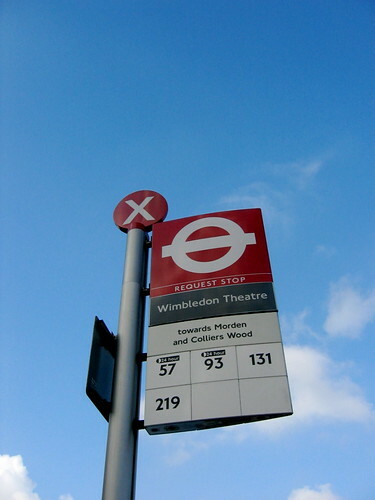 Bus stops have the London Bus symbol, a white circle on a red background with a white, horizontal line through the middle. If the symbol has the word “Request” written in red on the horizontal line, you’ll have to signal the driver with an outstretched arm in order to get the bus to stop. As on the Tube, fare pricing is divided into six zones, with Zone 1 in the city center. Fares are paid in cash on board (or with an Oyster card) and generally start at £2. Children under 5 can travel free anytime on London buses. Routemasters, the city’s red double-decker buses, were officially discontinued in 2005. While iconic, they don’t feature accessibility for handicapped people or strollers. However, nostalgic Londoners and tourists clamored for their return. 10 Heritage Routemasters are now still in service in central London. Refurbished with environmentally-friendly engines, they’ve been painted to appear as they did in the 1960s. The Docklands Light Railway (DLR) operates within the Docklands and south-east area of London, providing a connection between east London and the city. The network includes the areas around Bank, Tower Gateway, Stratford, Greenwich, Lewisham, London City Airport and Woolwich Arsenal. Service connects with more than 100 bus routes, five mainline railways, eight Underground lines, plus coach, taxi and river services. Additionally, the railway provides a direct, cost-effective and quick link to and from London City Airport; airport passengers can reach the DLR platform in just four minutes. There are over 20,000 licensed cabs in London. The minimum starting fare is £2.20 at all times, with metered tariffs that change depending on the time of day and day of the week. In the last few years, London’s had a real problem with unlicensed cabs, mainly operating at night; female visitors in particular should beware of climbing into unmarked cars without a prior booking. To book a cab in advance, use this roundup of listings. Known locally as the Blue Bike Scheme, this service enables inexpensive biking around London. Starting December 3, 2010, visitors and locals alike can use their Visa, MasterCard or debit cards at any bike docking station, follow the terminal’s simple on-screen instructions and release a bike — 24 hours a day, 7 days a week. Click here for a listing of free cycle guides, cycle routes and greenways. Traveling along the Thames and simultaneously taking in the sights? Yes, please. River Services leaflets can be picked up in Tube stations, or visit the River Services website for more information. A comprehensive travel planning site run by the Department of Transport, Transport Direct suggests various means of transport for any journey around the UK. The site requires you to enter a start and finish point, and the more detailed your information (i.e,. postcode, street addresses, mode of transport, departure time), the better the result. You’ll be given a detailed breakdown for each suggested route, including any needed walking or transfers, as well as your estimated journey time. Transport Direct also offers maps, ticket costs and the estimated CO2 emissions (in case you’re worried about that sort of thing). When you’re planning a holiday in London that will include some extra travel around Britain, Transport Direct should prove a very useful tool.